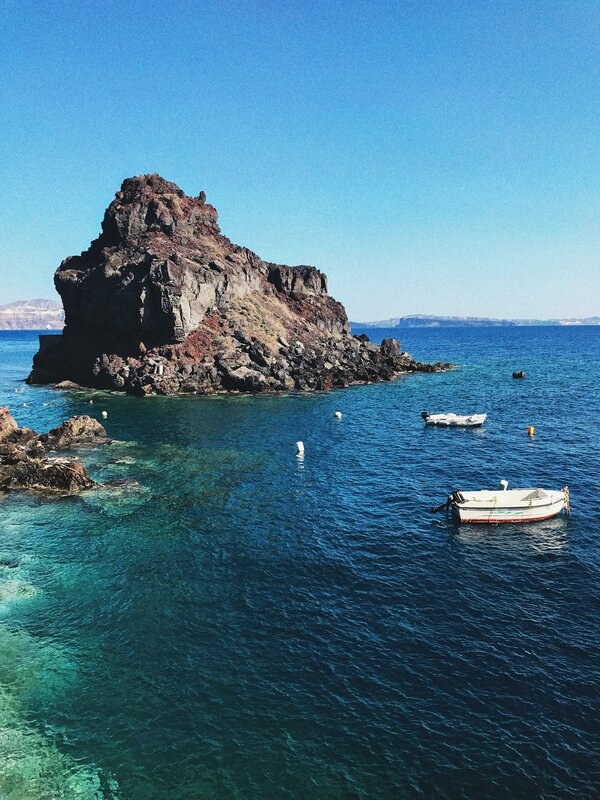 So, Spoiler Alert: Santorini is real. It shouldn't exist, but it somehow does. And it's got to be one of the most beautiful places on earth. The island is actually what's left of a volcano (which will never not be mind-blowing for me to think about), so it's essentially a big crescent shaped rock in the middle of the Mediterranean. And wherever you go, there are at least 180 degree views of blue. The color is a theme there, as many people probably know, which gives way to beautiful compositions everywhere. 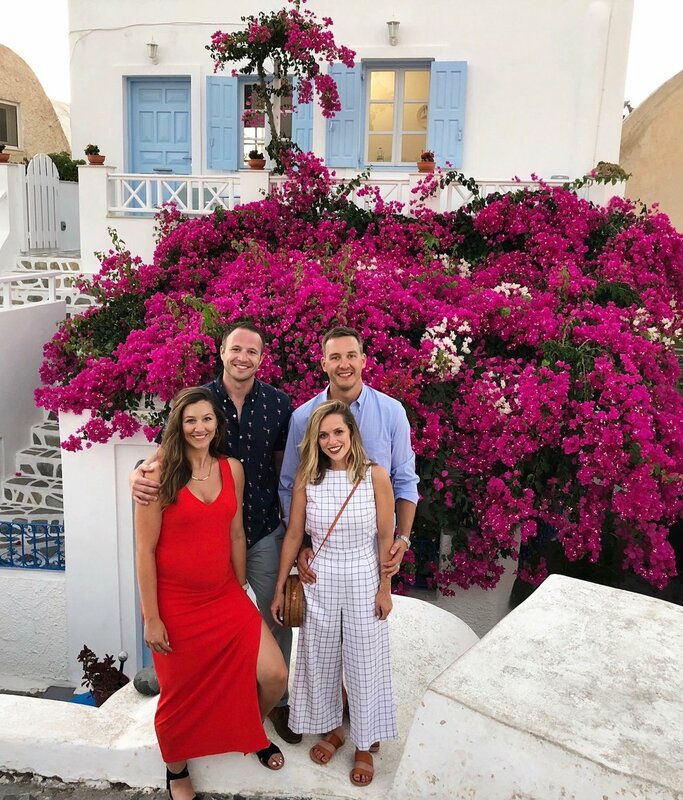 Although Jon wanted to murder me, I could have taken a photo in front of a thousand roughed up white walls covered in stunning bougainvillea or doorways painted bright blue. 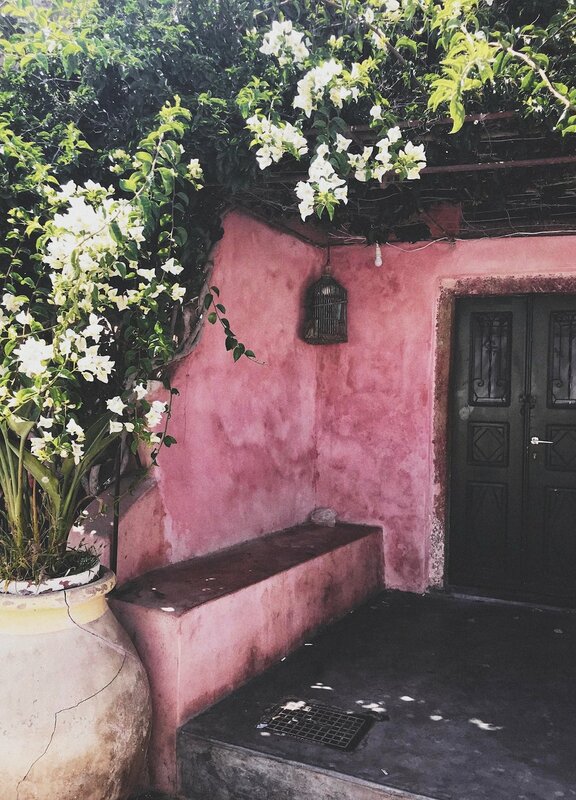 The architecture is so charming. The cliffs are dotted with layers of cave homes carved out of the volcanic rock, as well as smooth, domed houses that look like they were molded on a potter's wheel. They're all piled together like little marshmallows, most of them white and then some in pale pink and orange and cream. 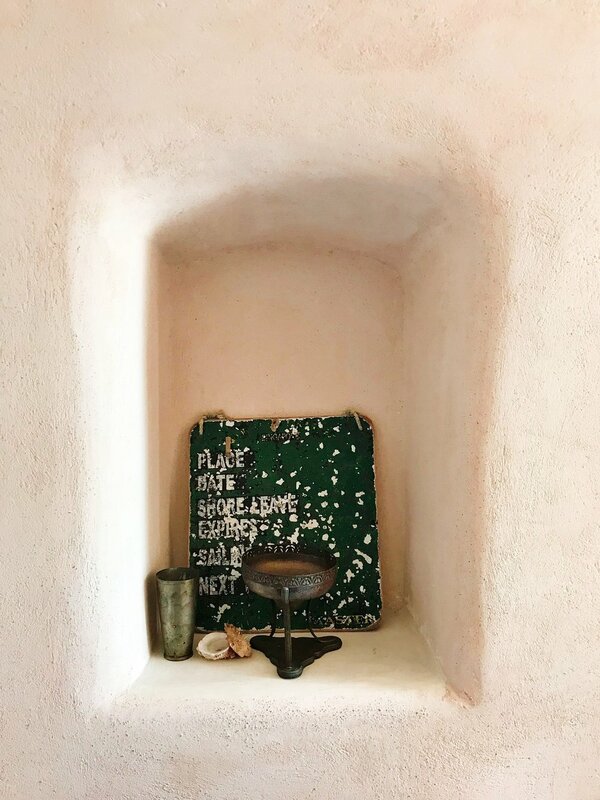 When we first arrived and set off on the winding path to find our Airbnb, we were already in love with the warmth of it all. The houses are situated quite close together and yet aren't really lacking in any privacy, because there is such a serenity and quaintness about everything—somehow, quaintness amidst the vastness of the Mediterranean. Ours was a traditional cave home with pretty wooden doors and windows and a cat sunbathing out front (naturally). It was basically one big room that, when the doors were open, felt like it extended into the ocean. It's difficult to describe, but kind of a pinch-me setting for sure. Especially as someone who'd gladly live in one room (probably one bed, even) with my three best friends for the rest of my life, this place was pretty much the nuts. Standing inside and looking out honestly reminded me of a Magritte painting—sort of an illusion of reality. Oh, and the bathroom was like a little cave with tiny star lights on the domed ceiling and a big hot tub. We spent a lot of time sitting in there and drinking beers and having contests of who could hold their breath the longest—all things you're supposed to do in a hot tub for sure and while buzzed for sure. And the water! Oh my god. I'm not a big ocean-swimming person, but Greece may have converted me. The water is crystal clear and warm. So, basically the opposite of, say, Cape Cod, where in my mind there is a Great White Shark or, worse, a jelly fish, hanging out an inch below the surface of the jet black, freezing water. Greece changed me! I think I like the ocean again. In fact, I'm still dreaming about it. What more does a kitchen need? It's a vibe, am I right? Bird's eye views in Fira, towards the center of the island. You can really see the crescent shape here! So here are some of my top recommendations and itinerary details. 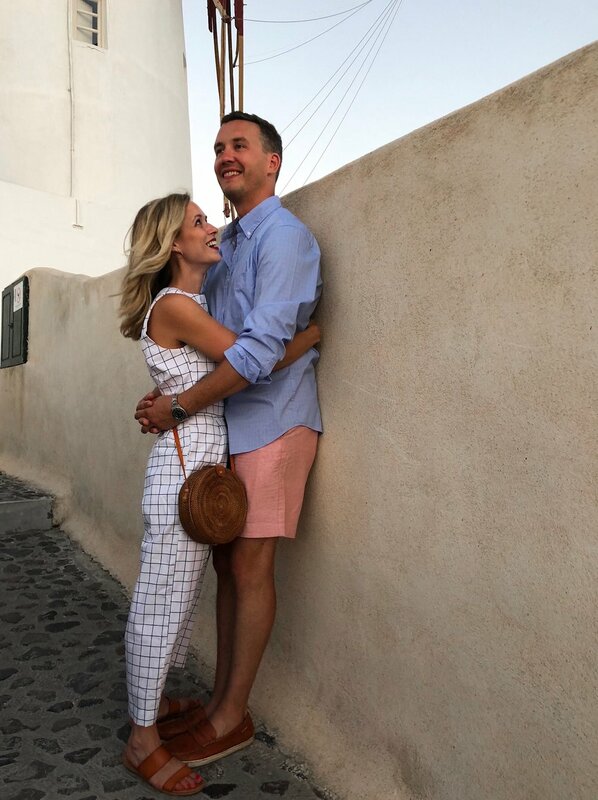 We first stayed here in Oia (highly recommend) for two nights and then here in Fira (recommend, mostly for the hot tub) for a night and loved both, particularly the cave home experience in Oia. 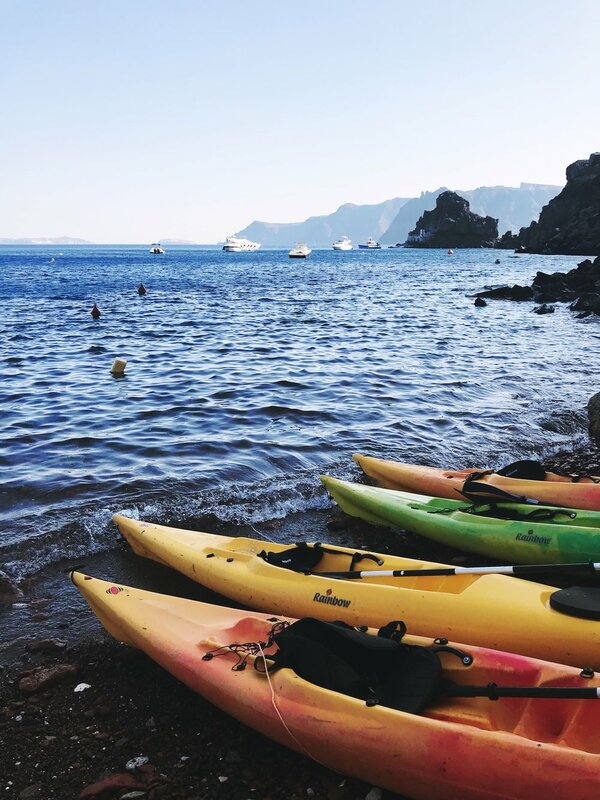 We found three nights and four days to be the perfect amount of time in Santorini, especially since we were out on the water for our catamaran tour for the better part of one day. I think we all agreed that it was worth it to splurge for a cliffside, ocean-view dwelling at least once, although if you don't, do not fret because you'll still be able to take in the views from all over and at tons of restaurants, too. If you do Oia, Fira, and/or Imerovigli, make sure you walk at least a portion of the really high up cliffside path that connects the three towns. 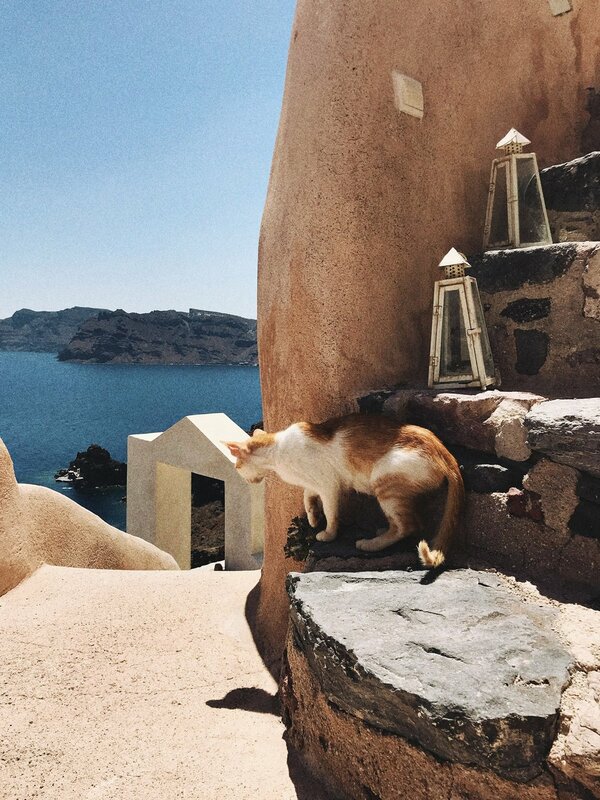 It overlooks the Caldera (the center of the crescent) the entire way, and the views seem to change and improve with every step you take (of both the sparkling water below and the great sampling of Cycladic homes and buildings along the way). We walked in Fira one evening during Golden Hour, and it was difficult to not stop every few minutes to take it all in. Eat at Pitogyros. It became a joke for the rest of the trip, wherever we were, that we wanted to check the ferry schedule to traverse the Mediterranean real quick to go back to Pitogyros for yet another gyro and french fries. A fun fact we learned from the sweet guy who owned the place is that lamb gyros are actually an American thing. 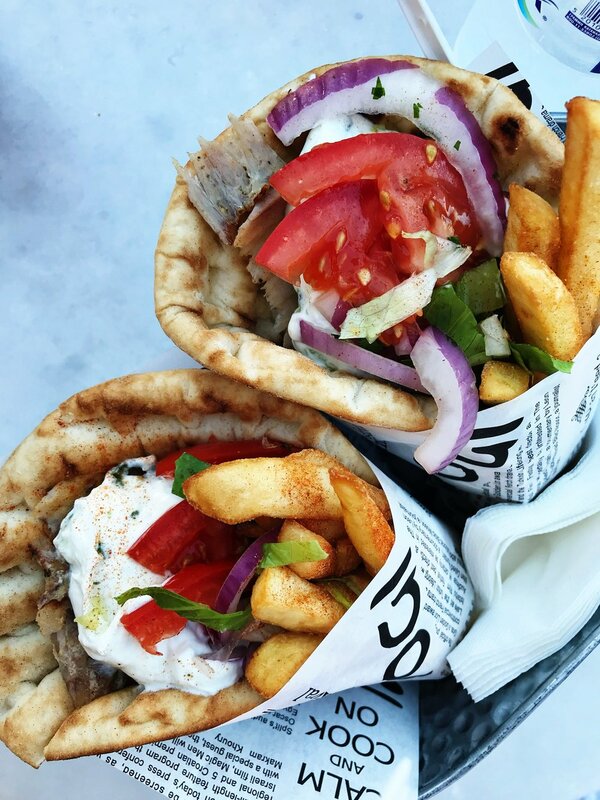 You'll find strictly chicken or beef at any authentic gyro places in Greece. That kind of blew our minds! We also liked Ambrosia for a more upscale, romantic vibe and surreal nighttime views. And more generally, the Greek salads there are incredible. They're really different from the versions here in the US, and are more like a bowl of the freshest tomatoes, cucumbers, peppers, and onions, with a big block of the best feta you've ever had, doused in the best olive oil, olives, and herbs you've ever had. I would truly eat like this everyday if I could, and I'd wait (impatiently) for my Greek Glow to kick in. Also, a quick funny story. We fell fast and hard in love with Greece's speciality coffee drink, called a frappé, which is a creamy and strong ice cold coffee with the thickest layer of foam I've ever seen. We were drinking several a day, usually answering "medium" to the accompanying question of "a little sugar, medium sugar, or a lot of sugar?" Halfway through the trip, our server told us we should be careful about our intake given the amount of PLASTIC in frappés. After a couple of quick terrified Google searches, we chalked it up to a language barrier and kept on consuming them with reckless abandon. Caffeine, maybe, is what he meant? But honestly, the thickness of the foam had us believing him for a minute. Best plastic I've ever drank, that's for sure. Get in the water (no matter which island you are on!). We kayaked to this big boulder sticking out of the water by Amoudi Bay in Oia, because from the shore, we could see a bunch of (tiny) people on it. It turns out, there's actually a church inside (!!) the boulder, and there's a high ledge built into the side for jumping off into the water below. I was a little scared to jump, but I also have a disorder where I can't be the only person who doesn't do something fun (see: peer pressure; see: FOMO). And it was really fun. We also decided to splurge for a more intimate catamaran boat tour, and it was well worth it—not so much for the coastline view (it's arid and rocky), but for the incredible swimming and for just cruising on the water. And speaking of the water, utilize the ferry system, too. (We flew into Athens, and then took a ferry from there to Santorini to Paros and then back to Athens). 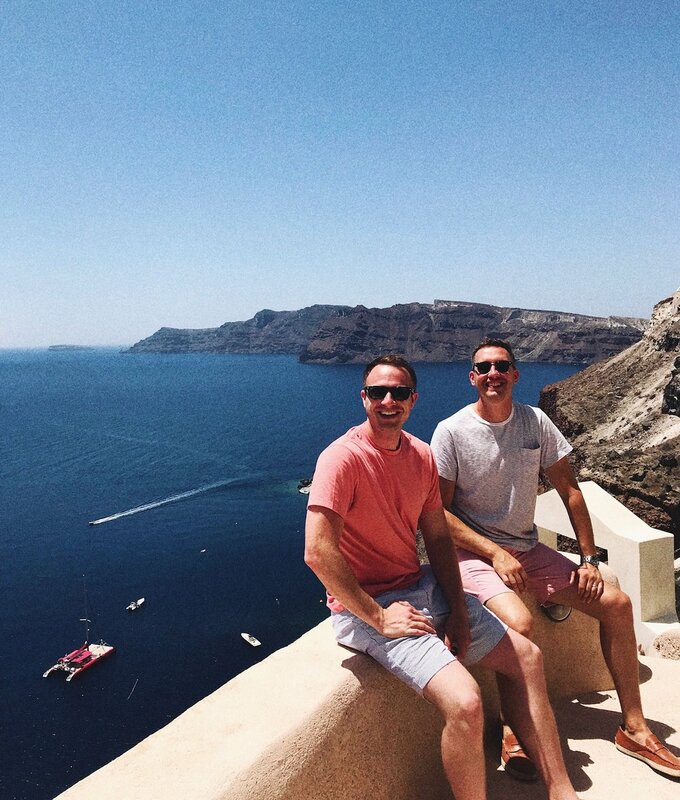 We found the ferries throughout the Cycladic islands to be a lovely way to travel—they were easy, fast, and comfortable, especially compared to flying. We had heard they tend to get cancelled fairly often, but aside from a small delay, we didn't have any issues. I think as long as you provide yourself with the ability to be a little flexible, the ferries should be reliable enough. 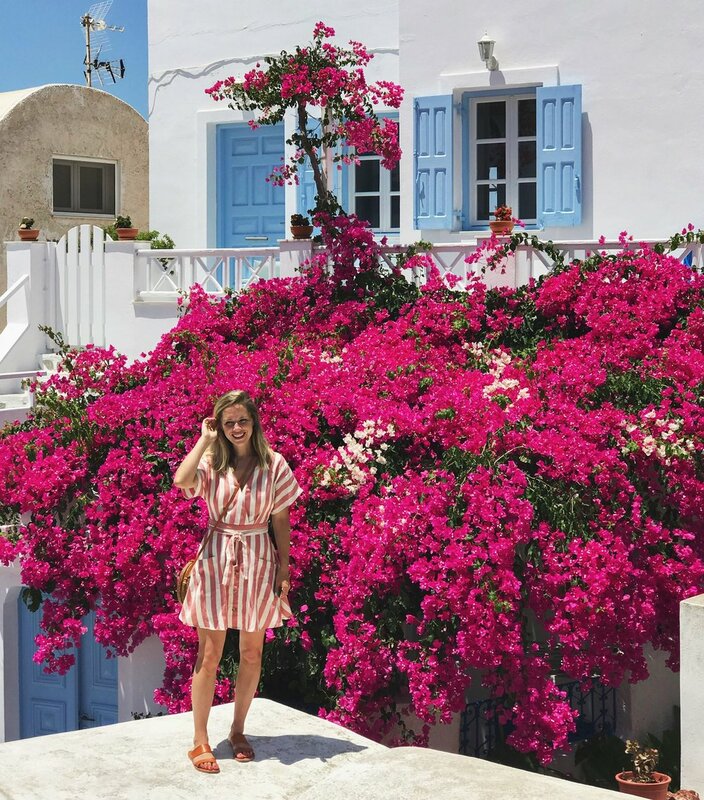 Since we were in full-on vacation mode and I tend to delight in travel spontaneity even when forced, I don't think it would have thrown us for much of a loop if we had been stranded on a Greek island for an extra night. Aside from shelling out some extra doll-hairs (which also feels scarily and strangely insignificant when on vacation, only to be a little earth-shattering once you return home and check your bank account), worse things have happened I am certain. And now having done it, I can't imagine not island hopping even more while over there (especially if you get tickets for the fast ferries which make a big difference in time savings) since each island seems to offer such a different kind of experience. Next up: Paros, the quiet island that surprised us and knocked our socks off. And PS, the last international trip we took as a foursome: Southern Iceland.